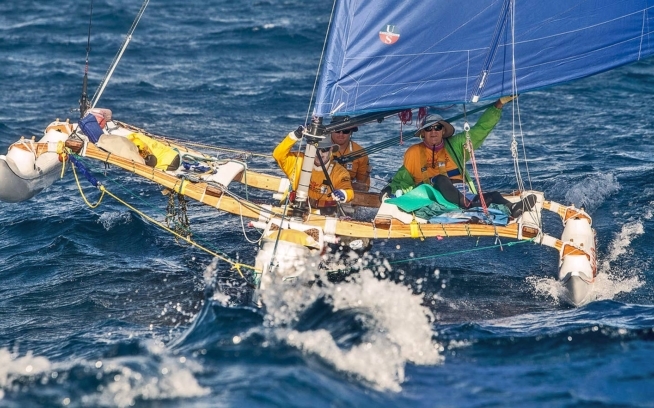 Last November, I boarded a sailing canoe for the Tahiti Nui Holopuni Va’a Channel Crossing race. The event was from Tahiti to Bora Bora: five legs, five days, six islands, and 215 miles of a challenging and inspiring journey through the jewels of French Polynesia. I am not a paddler and not much of a sailor yet, but I had been secretly dreaming of this adventure since finding out about it. When the news came that they were looking for a last-minute crew, my old friend Cédric convinced his captain to take me on by telling him, “Léa is fit and stubborn, she will never give up!” To wash away my fear of paddling for so long, Cédric told me, “Of course you can do it, as a faahoro—paddler up front—you will spend most of your time on the trampolines anyway.” Well, that’s how good stories begin, with slight twists of the truth. The Holopuni is a three-person, 30-foot sailing canoe with double outriggers. It has a removable centerboard and is steered by the peperu with a simple steering paddle. Nick Beck, of Hanalei, Kaua‘i, developed the first prototypes many years ago and sailed them around the Hawaiian Islands with a group of friends and family. 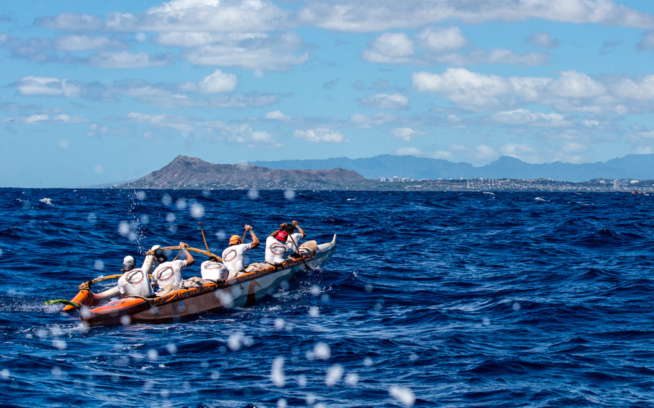 Although it’s not the typical sailing canoe Tahitians used to navigate—those had a single outrigger—there is a growing interest in them in Tahiti. They already have ten of the canoes and a community of excellent watermen who have found a new way to celebrate the ocean and brotherhood in the Holopuni. I was searching for that feeling of sailing in a simple craft and wanted to learn from this unique experience. Our sailing canoe is named Kua Nalu, meaning “to surf before the wave breaks.” She was one of the first Holopunis imported to our islands over 15 years ago. Thierry, her captain, is the MacGyver of watersports; he is always improving gear and imagining new features. 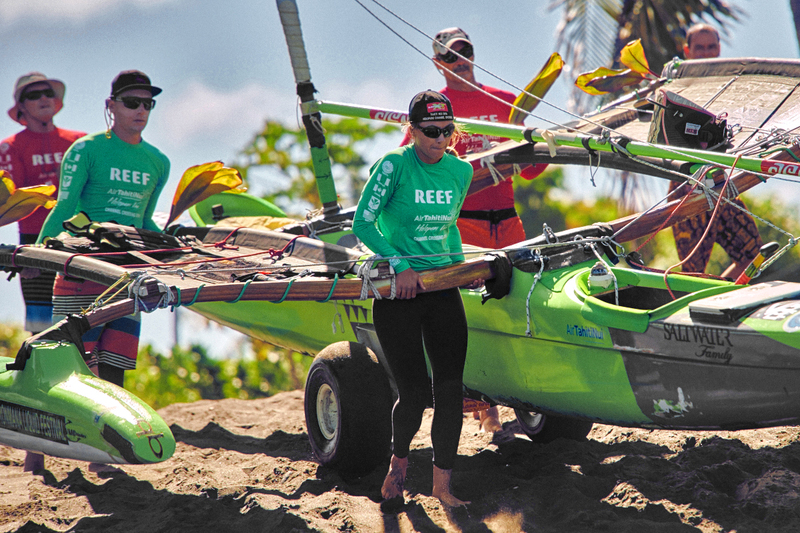 For this race, Kua Nalu is equipped with a built-in compass in front of the peperu, two self-bailers, a kit of emergency flares and spare equipment (rope, elastics, rubber bands, carabineers, screws, bolts, paddles). We navigate with numeric charts on an iPad (with a couple of backups on phones) and two power banks. The race organization has provided each canoe with an inReach Explorer satellite communicator. I carry my own hydration and food, sun protection, rain jacket and insulation stashed in a small basket in front of my seat. Traditional food made of locally sourced products is on the menu after every leg of the journey. Our meals consist of unprocessed natural ingredients blended with tropical flavors. Breadfruit, taro root and sweet potatoes are the base. Fish, from the open ocean or the lagoon, is the king of the table. The fish is grilled or served raw in coconut milk. Fresh fruits keep the sweet tooth happy. Food is served on a leaf, as Tahitians used to do before plastic was introduced. This friendly community of Tahitian watermen promotes life balance through sport and healthy living, and French Polynesia needs this message (processed foods are becoming more prevalent). For one year, I was a nurse on a tiny island where obesity is standard, so seeing the Tahitian approach to food was like seeing a rainbow after the rain. This race is a way to bring back not only traditional sailing canoes but also traditional healthy living habits. Aboard Kua Nalu, I quickly understand that things will not go according to the plan. A very light wind is forecasted through the week and I will have to learn to paddle very quickly! The first leg from Tahiti to Moorea gives me a taste of surfing the open ocean. At the paradise-like motu canoes are lined up like a colorful flock of tropical birds. We are last, no surprise there. The boys, sunblocked up, hat and shades screwed on, camel bags as appendages of the backs, are buzzing around the canoes with large smiles. Big hugs come from every crew. A lot of these men are longtime friends and I am starting to get the feeling of what this is about, not only performance but also strong brotherhood. 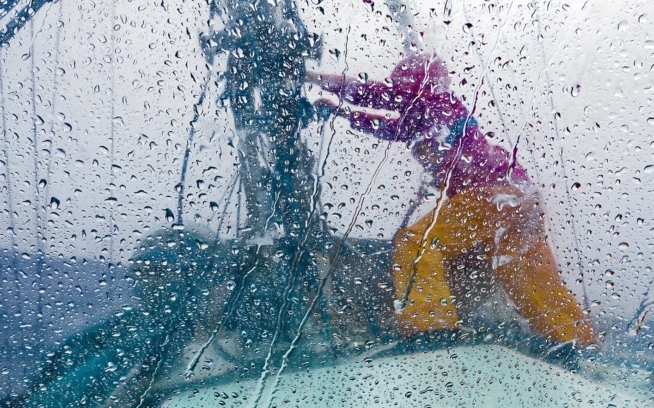 The next day is the masterpiece—105 miles with a five-knot wind. Pink sky, no clouds: a hot and long day in the making. For the first three hours we manage to stick with the other canoes. Thierry is dedicated to coaching my paddling technique and my role as faahoro—giving the rhythm. I see a difference in my body as the day goes by, as my muscles suffer, only with the right form will I paddle for 12 more hours. My mind, which usually runs too fast, has to slow down and focus on the movement. In my semiconscious state I start hearing Thierry’s voice and I find the rhythm within me. “Stretch your back, breathe in, twist your chest, push your opposite leg to the side, use your core, breathe out,” he says. We take turns resting on the trampoline, snack on fruits and energy bars, and develop a sustainable routine. Some 16 hours after departure we finish the second leg and arrive to find a fairytale of flowers, ukuleles and comforting hugs. On our day off, a local group of activists, who promote a natural lifestyle and the protection of resources, welcomes us for a traditional lunch. It’s interesting to see how the food I described earlier is all I crave after the effort of the previous day. Rich and energy-packed, it is surprisingly light to digest and satisfies my belly for the whole day. I squeeze in a surf session and gain a new Tahitian tattoo on my knee. On the third leg, we come in fifth thanks to a little more wind and a better route strategy. The landing spot is the most important marae of the Polynesian culture. The group recollects here, in a silence established by the mana of the sanctuary. A short last leg in the turquoise lagoon and we can call it a day. To produce the effort to reach Bora Bora, I have to dig deep. My hands are covered with blisters and my throat is on fire. My body is extremely stiff without being painful. Mauna, from another team, looks at me as I walk in the kitchen at first light. “Drink this if you want to make it through the day,” he says as he hands me his ginger juice. This thing shakes me up, it sets my whole body on fire, and I must sit down a moment. Then he makes me drink some turmeric and pepper concoction that gets me standing up again. Jersey, sunblock, hat, sunglasses, camel bag and I am ready! I am excited to meet Bora Bora, Pearl of the Pacific. It’s my first time to all of these islands. Discovering them by sailing canoe, like in the old days, has a special meaning to me. I don’t think I can ever forget our slow approach to each of them, the effort delivered and the reward of seeing these jewels floating on the horizon of my favorite ocean. Léa is a French surfer and adventurer based between Biarritz and French Polynesia. Dedicated to her passion for the ocean, she is committed to a simple lifestyle on the roads less traveled, in her van or aboard her sailboat.